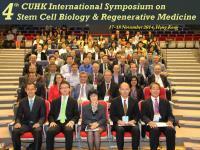 The 4th CUHK International Symposium on Stem Cell Biology and Regenerative Medicine was successfully held at the Prince of Wales Hospital on 17-18 November 2014. The Symposium was jointly organized by the Department of Orthopaedics and Traumatology, CUHK; the Stem Cell and Regeneration Program, School of Biomedical Sciences, CUHK; the Sports Medicine And Regenerative Technology (SMART) Program, Lui Che Woo Institute of Innovative Medicine, Faculty of Medicine, CUHK; the Centre for Stem Cell and Regeneration, CUHK; and the MOE Key Laboratory for Regenerative Medicine (CUHK-Jinan University). Prof. Chan Wai-yee, Director of School of Biomedical Sciences and Prof. Li Gang, Deputy Chief of the Stem Cell and Regeneration Program, together with the representatives from the Department of Orthopaedics and Traumatology and the MOE Key Laboratory for Regenerative Medicine (CUHK-Jinan), served as the Co-Chairs of the Organizing Committee for the Symposium. Along with more than 30 invited speakers from all over the world, our School members including Prof. Feng Bo, Prof. Jiang Xiaohua, Prof. Kingston K.L. Mak and Prof. Wan Chao delivered talks on their research work in different fields of relating to the theme of the Symposium. Prof. Kenneth K.H. Lee, Chief of the Stem Cell and Regeneration Program, also served as a session moderator. The Symposium itself has become an effective and fruitful platform for basic scientists and clinicians to share their experiences and latest research findings in areas of stem cell biology and regenerative medicine. The 5th CUHK International Symposium on Stem Cell Biology and Regenerative Medicine will be held on 15-16 November 2015 in Hong Kong. The Symposium Programme can be viewed HERE. Please also click HERE for the corresponding coverage by the Symposium Secretariat. Copyright © 2019 School of Biomedical Sciences. The Chinese University of Hong Kong.